Captivated by the notion of transforming herself into a man to escape the arranged marriage and fulfill her father's dream, Deborah embarks upon an epic journey across the desert to find a mysterious elixirist rumored to be blessed with the gift of turning women into men. It is a journey that proves increasingly perilous--filled with wild beasts, lustful men, unscrupulous priests, and warring tribesmen. Yet Deborah discovers that she is not alone; an unlikely coterie of lepers, slaves, Moabite traders, and even a dead tiger come to her aid and defense along the way. 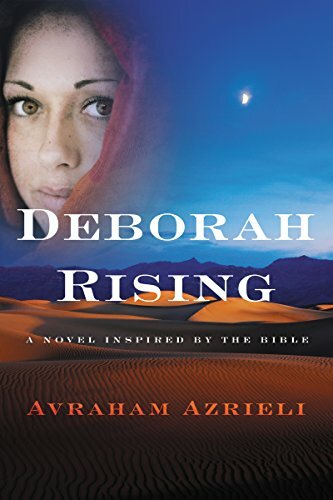 Part traditional biblical fiction, part adventure, Deborah Rising is a captivating tale about the early life of one of the most famous figures from the Old Testament--a woman of courage and spirit whose battle to overcome discrimination, sexism, and paternalism speaks to women's lives today. My Review: Deborah Rising is a reimagining of the life of prophetess Deborah from the Bible. Deborah had always believed that she was meant to be a prophet. After the unjust stoning of her innocent older sister, Tamar, Deborah is forced to be betrothed to the cruel son of the local judge, In order to prevent her marriage from happening, Deborah runs away from her city. Not knowing where to go and realising the harsh realities for a woman of her times, she embarks on a quest to find a magic elixirist who is rumored to turn women into men. As Deborah finds the magic elixirist, can she finally become the prophetess that she was meant to be? I emphasized with the character of Deborah. When we first meet her she is an orphan thirteen year-old girl who just witnessed her sister’s murder and is forced to become betrothed to her sister’s murderer. She lives in a harsh world where women do not have any rights and their voices are not allowed to be heard. Because of the times that she lives in and that she goes through many hardships as a woman, she wishes that she could become a man because it could give her the freedom that she craves. I also thought that Deborah grows into a more mature character. She constantly struggles with her faith and with her fear. Thus, Deborah is a very realistic and sympathetic character. Overall, this book is about pain, loss, trials, strength, courage, and faith. The message of this book is to not give in to fear. The only thing I did not like about this novel is that all the characters except for Deborah were very stereotypical. However, I loved how the author made ancient Israel very realistic and showed us how hard it was for a women living in those times. I thought the story was very well-written and thought-provoking. Even though the author took many liberties with the early life of Deborah, it did not bother me as I was reading. It was a very fast-paced and adventurous read that kept me up late as I wondered what would happen to Deborah. The story ended with a cliffhanger, I can’t wait to read the sequel. I would not recommend this novel to those who love traditional biblical fiction that are faithful to the Bible and suggest for you to read The Prophetess by Jill Eileen Smith instead for a more faithful retelling. However, for those who did not mind the liberties the author took from the Biblical characters, it is a worthwhile read. I recommend it to fans of Angela Hunt, T. K. Thorne, and Rebecca Kanner. I appreciate getting to see Biblical characters in a new light through stories like this. I'm glad you enjoyed it so much!